Do you love the great outdoors? Are you thinking of decorating your wall spaces with decor that reminds you of the open air? Read on! 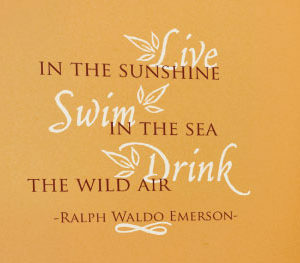 ‘Live in the Sunshine Swim in the sea Drink the wild air. 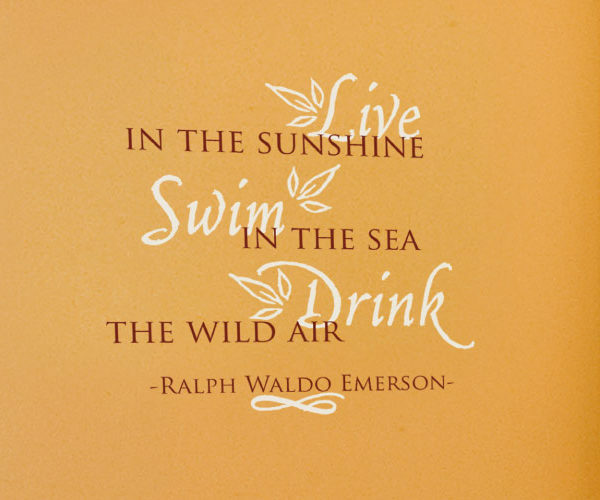 – Ralph Waldo Emerson’ wall words meet this need. We tried them out in the living room that blends comfort and the outdoors look in a remarkable way! Natural light streams in from the windows and draws the eyes towards the wall letters. The wall letters look great on the wall space above the couch and contrast well with the orange underlying wall! They do hold their own against the rustic coffee table and sunflowers. Friends and family will certainly enjoy this space with its unique, decorative message on the wall! 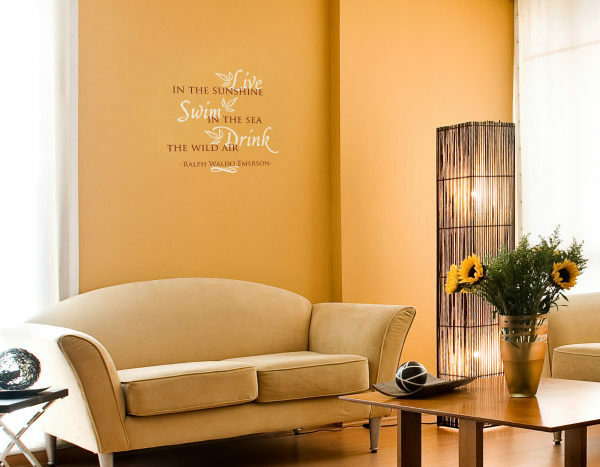 At DecorativeLettering, we have wall quotes that are suitable for all wall spaces in your home and business as well! 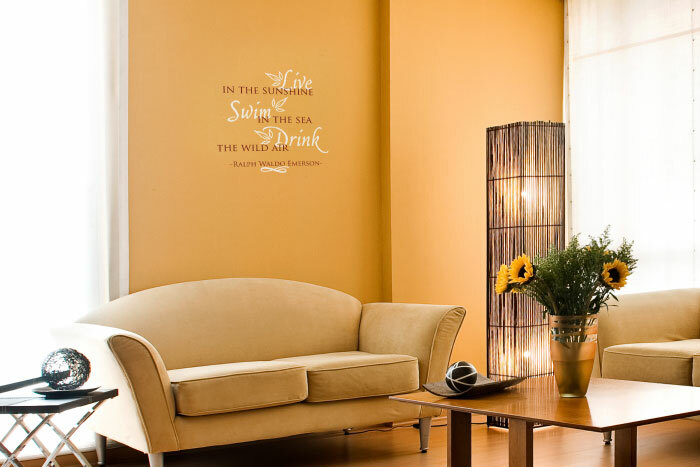 Our wall decals are available in a variety of colors, style, and size. You will find something that will fit into your wall space and match your decor! Our designers are good at what they do. You will end up with quality wall lettering you will enjoy for years to come! 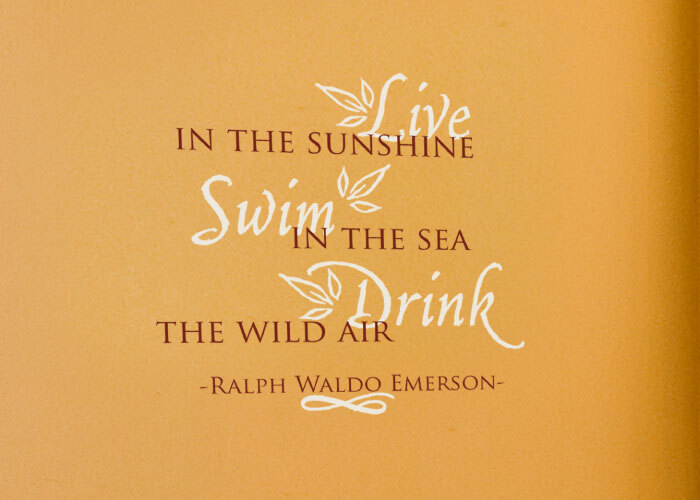 Our wall words are durable and affordable. Resin made, they are resistant to extreme temperatures and will look great every season. Friends and family will enjoy spending time in this space with inspiring wall words. Get in touch!